HAPPY APRIL to All Students & Faculty! Click above "Excellence Built Here" image to view video. Click above NABJ image to view video. 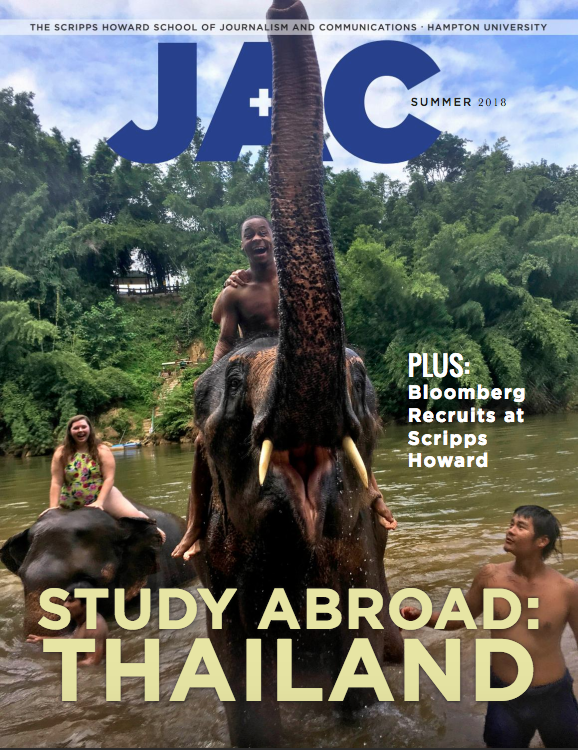 Click here to read the latest issue of JAC Magazine. 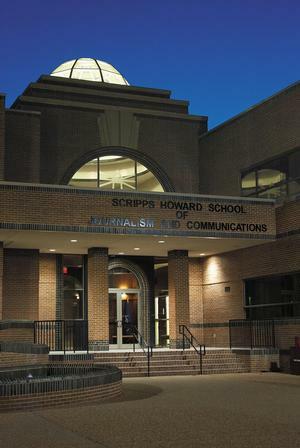 Founded in 2002, the Scripps Howard School of Journalism and Communications emphasizes excellence and innovation while adhering to the core standards and ethical principles of the industry. "Give light and the people will find their own way.” This motto, coined by the Scripps Howard Foundation, has been the guiding inspiration of Hampton University’s Scripps Howard School of Journalism and Communications since its inception in 2002. Uniquely designed as a modern, symbolic lighthouse, the Scripps Howard School was built with a vision to produce ethical and competitive leaders equipped to practice excellence and innovation in multimedia technology while adhering to the core principles of journalism and communications. HAMPTON, Va. (March 29, 2019) – Registration is now open for the 2019 National Association of Black Journalists (NABJ) Region I Conference, April 12-14, 2019, which will take place at the Hampton University Scripps Howard School of Journalism. This year’s theme is “Reclaiming Our Story: Guardians of Our History Since 1619 and The True Responsibility of Black Journalists Today.”. HAMPTON, Va. (March 4, 2019) – The Hampton University Scripps Howard School of Journalism and Communications welcomed A. Peter Bailey, an associate of Malcolm X, to the Caldwell Café series on Tuesday, February 26, 2019. Bailey lectured about various aspects of his life, including when he first heard Malcolm X speak in Harlem, his affiliation with the Organization of Afro American Unity (OAAU), and the day Malcolm X was assassinated. HAMPTON, Va. (January 18, 2019) – Writing, writing and more writing was the theme of the 2019 Hampton University “Scripps Days” Event in the Scripps Howard School of Journalism and Communications. Scripps welcomed honored guests from The Scripps Howard Foundation to showcase students and to demonstrate how a $100,000 grant from the Foundation has been used to embark on a new content management system. HAMPTON, Virginia (Dec. 18, 2018) -- A record-setter from the 2014 Little League World Series for Taney Little League, Mo’ne Davis has signed her National Letter of Intent (NLI) to play softball for Hampton University starting in the fall of 2019. HAMPTON, Virginia (Sept. 25, 2018) -- Matthew Winkler, Bloomberg News founder, editor-in-chief emeritus and author of "The Bloomberg Way," will be the special guest at a moderated Q&A today, Tuesday, Sept. 25, from 4:30 to 6 p.m. at Hampton University's Scripps Auditorium. HAMPTON. Va. (August 15, 2018) - Congressman Robert C. “Bobby” Scott of Virginia was welcomed to the Hampton University Scripps Howard School of Journalism and Communications TV studio. Congressman Scott, who is serving his thirteenth term, representing Virginia’s Third Congressional District, requested to utilize the state of the art television studio at Hampton University to tape a PSA. HAMPTON, Va. (July 6, 2018) — Hampton University rising senior, Leondra Head, recently published her first book entitled, Walking In Your Path, a self-help novel encouraging young adult students and young adults to follow their passions. HAMPTON, Va. (July 5, 2018) — Hampton University Scripps Howard School of Journalism and Communications (SHSJC) Assistant Professor Butch Maier has released the first trailer for "Mother of a Day," his comedy movie about an African-American family. HAMPTON, Va. (June 8, 2018) — Hampton University hosts the first Latino Resource Fair at the Hampton University Center for Hispanic Achievement and Training (HUCHAT) on Saturday, June 9th from 10am until 1pm at HUCHAT (Suntrust Building, 4th fl), 11817 Canon Blvd, Suite 408, Newport News, VA 23606. HAMPTON, Va. (May 17, 2018) - April Woodard, an Assistant Professor in the Hampton University Scripps Howard School of Journalism and Communications, has been nominated for an Emmy® Award for her work as a co-host on Coast Live on WTKR, and for hosting the Norfolk Christmas parade, among other events throughout the year. This year’s 60th Emmy® Awards, which includes Virginia, Maryland, and Washington, D.C., will host a Gala to present the winners on Saturday, June 23, 2018 in Bethesda, MD. HAMPTON, Va. (May 16, 2018) — The Hampton University Scripps Howard School of Journalism and Communications student Kyla Wright has been awarded the Betty Endicott Scholarship worth $5,000 to be used towards her Hampton University education. The Betty Endicott Scholarship is given out annually from the National Academy of Television Arts & Sciences-National Capital Chesapeake Bay (NATAS-NCCB) Chapter to full-time undergraduate or graduate students who are studying communications and/or broadcast journalism. The scholarship is named after Betty Endicott, the first female news director in Washington, D.C.
HAMPTON, Va. (March 26, 2018) – Hampton University Scripps Howard School of Journalism and Communications students met one of the leaders in their future industry -- Public Relations Society of America (PRSA) President and CEO Dr. Joseph Truncale – during his visit here March 26. Scripps Howard Dean DaVida Plummer was grateful to have one of the top professionals in the public relations field take the time to share his experiences with students. Washington D.C. – 02/16/2018 –The National Association of Nonprofit Organizations and Executives (NANOE) is pleased to announce the appointment of Jay Lang to NANOE’s prestigious 2018 Board of Governors. Lang has been called upon to refine, improve, and strengthen New Guidelines for Tomorrow’s Nonprofit (Second Edition) a new set of governing guidelines that supercharge nonprofit capacity-building. WASHINGTON, D.C. (Jan. 10, 2018) — Six students and one professor from Hampton University’s Scripps Howard School of Journalism and Communications attended a three-day business journalism workshop Jan. 8 to 10 in the Bloomberg News office in Washington, D.C.
CINCINNATI (November 29, 2017) – The Scripps Howard Awards, one of the nation’s most prestigious journalism competitions, will accept entries from Dec. 1 to Feb. 2. The Awards’ 65th competition will present $170,000 in prize money for work across 16 categories, including the Impact Award, which will honor the year’s best work from all winners. The awards will be presented on April 19, 2018, with a live show hosted by “60 Minutes” correspondent Lara Logan. HAMPTON, Va. (Nov. 21, 2017) -- Six Hampton University students enrolled in the Scripps Howard School of Journalism and Communication’s business journalism course can report a capital gain in January. The nation’s capital, that is. HAMPTON, Va. (Oct. 24, 2017) -- Hampton University’s Scripps Howard School of Journalism and Communications celebrates its 15th annual “Scripps Day” Oct. 25, commemorating its longtime partnership with The Scripps Howard Foundation. CINCINNATI (Oct 20, 2017) – The Scripps Howard Foundation is launching a year-long postgraduate fellowship program designed for individuals who aspire to journalism leadership positions in the media industry. Four individuals will be chosen for a Scripps Howard Fellowship, which will begin in June 2018 and run for 12 months. The program is offered in partnership with the Scripps News Washington Bureau, Newsy and ProPublica. Participants will be able to choose from among several reporting or newsroom experiences in Washington, D.C., and New York City. In addition to their immersive newsroom residencies, participants will convene for a series of workshops on leadership, project management, innovation and the business of journalism. HAMPTON, Va. (Aug. 25, 2017) – Future journalists and MBA candidates wanting to learn about the world of business reporting have a new Hampton University course to up their game and their academic experience. Business Journalism JAC 451 has been added to the curriculum for fall semester. 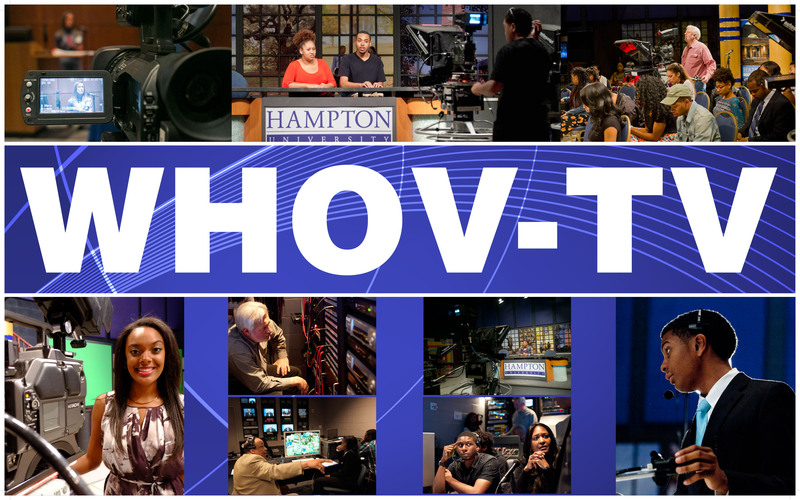 Hampton University’s Scripps Howard School of Journalism and Communications (SHSJC) is putting its students on the path to working in Hollywood production houses and Silicon Valley firms with new Digital Media Innovation and Animation & Motion Graphics classes. Thirteen students from the Scripps Howard School of Journalism and Communications were inducted into the prestigious Kappa Tau Alpha (KTA) Honor Society on Friday, April 21 including six seniors and seven juniors. Admission into the society is by invitation only, reserved for those students in the top 10 percent of their respective classes. The 13 joined eight current members. Hampton University is hosting its 39thannual Conference on the Black Family from Wednesday, March 15 to Friday, March 17. This year’s conference seeks to explore the developments of technology and increase public recognition of how technology affects us all and the generations to come. The theme, “Design 101: Black Families Rising Up!” will acknowledge attributes, the work and research done by African-Americans in the STEM fields -- science, technology, engineering and mathematics -- along with Hampton students. On Tuesday, March 7 at 7:30 p.m., writer, researcher and author Margot Lee Shetterly will hold a book signing for her No. 1 selling book "Hidden Figures" in Hampton, Virginia. Shetterly, 48, will speak at the Hampton Roads Convention Center, which is open to the public. Woodard and Furey show us daily how they have mastered the art of TV chat. They skate effortlessly from one subject to another, from Pet Pal of the Week to the latest festival in Virginia Beach to the delights of kolache, a pastry from Eastern Europe." Shelves were filled with teddy bears, Hallmark was selling flowers, and Chick-Fil-La was preparing its heart-shaped biscuits and platters for Valentine's Day. Some people can't wait for Feb. 14, but some Hampton University students were simply not in the spirit this year. The traditional Valentine’s Day of a man showering his woman with gifts seems to be outdated and overrated, according to some young women at Hampton University. “Who is the real HU,” you might ask? Well, the Hampton University women’s and men’s basketball teams take on Howard University Saturday at 4 and 6 p.m. at Hampton University's Convocation Center. Students and alumni from Howard, Hampton and nearby universities attend each year. Cheerleading teams and dance teams prepare to entertain the crowd. Like other collegiate sports, cheerleaders practice throughout the week to prepare for upcoming games. HAMPTON, Virginia -- Super Bowl Sunday in a house full of young women is not a typical game party. Upon walking into the apartment you didn't get the vibe that the biggest football game in the world was on television. Songs such as "Best of me" by Jay Z and Mya were being played. Wine was being poured instead of beer and hard liquor. At Hampton University here, a contingent of Atlanta-area students said they are thrilled that their NFC champion Falcons will play for the ultimate prize. "It's really a great feeling to see the Falcons finally going to the Super Bowl in my lifetime," said Carlton Griffin, a journalism major/cinema studies minor from Ellenwood, Georgia. "I've been a fan since I was born and it's been a tough ride being a Falcons fan. The new Black Entertainment Television show "The Quad" premiered 10 p.m. EST Wednesday, Feb. 1. The drama series focuses on the student life at HBCUs --Historically Black Colleges and Universities -- and the issues that occur: Relationships between teachers and students, gender stereotypes in leadership, racism, hazing, underage drinking, blackmail, and, homicide. Hampton University and Mass Media Arts alumna Allison Seymour will be a guest speaker at Sunday’s Founder’s Day. The accomplished Scripps Howard School of Journalism and Communications Hall of Famer said she was overwhelmed with excitement to come back and share her words of wisdom with Hampton University students. Seymour said she intends to encourage and remind students to let their lives do the singing like the words of the alma mater. Hampton University is preparing for its annual Martin Luther King Jr. holiday celebration on Monday, Jan. 16. Students and faculty plan to participate in a campus-wide march beginning at 10 a.m. at the Emancipation Oak and end it at Ogden Hall. Following the march, there will be a program to honor King’s legacy at 11 a.m.
On Jan. 6, over 200 people wrapped around the Hampton History Museum for author Margot Lee Shetterly’s “Hidden Figures” book signing. There were so many supporters in attendance, young and old, all inspired and or curious about the untold story of three black women making a huge contribution to American history right here in Virginia. Hampton University School of Architecture students placed second in the 2016 Ford Motor Company HBCU Challenge 2016 Ford Motor Company HBCU Challenge winning them $15,000 in student stipends. Each year, Ford Motor Company conducts a competition that supports student led community projects at Historically Black Colleges and Universities. The purpose is to strengthen and contribute to underserved communities. The award will help students continue to work on those projects without having to take side jobs while continuing their education. Hampton University President Dr. William R. Harvey has called a press conference for noon, Friday Nov. 18th to discuss the University’s commitment to yield “not one inch” of campus property for the Virginia Department of Transportation’s proposed expansion of Interstate 64. The President and CEO of the National Geographic Society, Gary Knell, will visit the Hampton University campus April 20-21, 2016. Former top NBC Executive, Paula Williams Madison, was featured at the Caldwell Café event in the Scripps Howard School of Journalism and Communications (SHSJC) on Wednesday, April 13, 2016 at 6 pm.